This is a practical course, so you will learn how to make finished dishes, as well as the basic methods. This course focuses on Chinese and Taiwanese cuisine, including traditional, home-style and stir-fried dishes. The goal of this kind of course is to help you understand how different elements of Asian cooking fit together, so you express your creativity instead of simply following recipes without really understanding them. Then you will be able to mix and match the various techniques to make a wide variety of complete meals. This will also give you a firm basis for learning more on your own in future. We start the class with soy bean milk -- as I very often hear from my Western guests, it's a healthy drink, and it's a very popular morning drink in Asia. I will also talk about all the basic Chinese ingredients, so you will have a good idea about how to create Chinese cooking in future. Then I will use the basic ingredients to make some very simple dishes like soft tofu with Taiwanese dressing, and sour and spicy soup. After introducing the basic ingredients. I will show you how to make the sesame paste, and a make few different noodle dishes based on it. But you can also use the sesame paste in western dishes, such as using it as a salad dressing or dipping sauce. The dumplings we will make are based on bread dough (yeast dough). I assume most people are fairly familiar with bread dough. 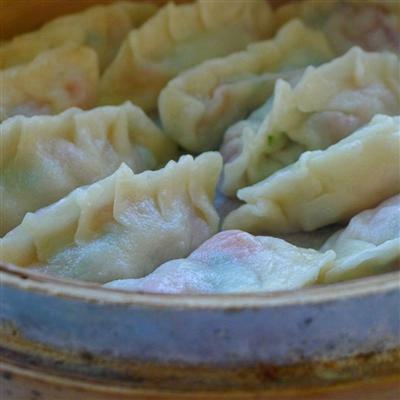 So after the class, you should be able to recreate how to make the dumplings very easily. Cost: Our price for this standard three day class is NT$12,000 for one student (about US$400 or 300 Euros), and NT$21,000 for two students. Sorry, but we do not offer discounts for these classes. Normal class size: 1 - 4 students (larger classes may be possible). Time: Classes usually start at 10am or 1pm and last about four hours each day, so the total class time over three days will be about 12 hours. Please always contact us well in advance to make a reservation. We will try to arrange the classes to fit your schedule.